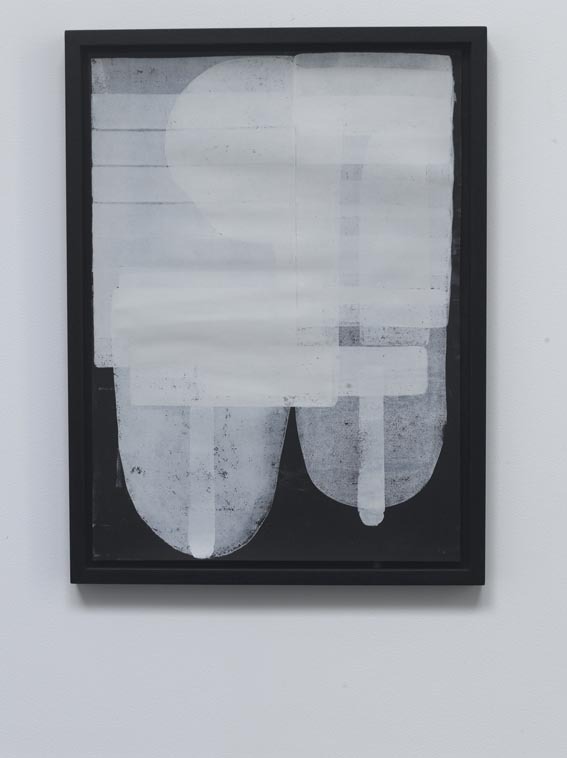 Maintaining the monochromatic theme from the last article, Explorations in Materiality and Texture, Will Rogan and Zin Taylor’s work at MOT International utilise black and white in their images for contrast in tone, not texture. 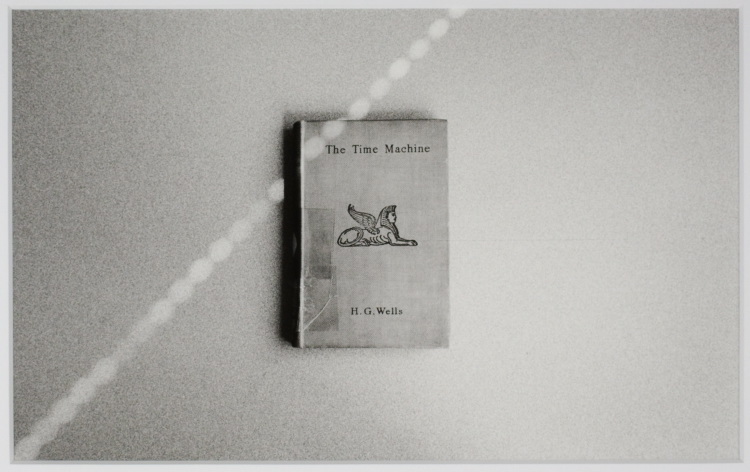 In Rogan’s greyscale photographs The Time Machine Scratched (2010) and The Time Machine Open (2010) a beaded, narrow line of light falls across an old copy of H.G. Wells’ The Time Machine as though piercing through the gap between two Venetian blinds. As we compare the two images, we see the light falls across the book in different positions indicating time has passed or been travelled between during the time it has taken to turn from the cover to the first page of text. The use of traditional black and white photography perhaps indicates the work itself could belong to a time since surpassed by technological innovations in colour photography, yet it remains crisp and new from having teleported to today from when it was first created. 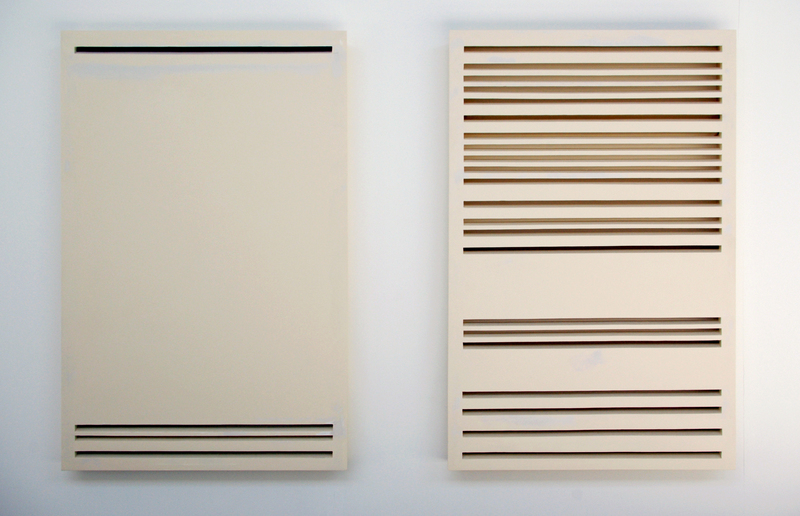 These are contrasted with Taylor’s series of abstract works, An Arrangement of Voids, in which geometric blocks of white printing ink that might perhaps resemble thimbles, test tubes or lavatories, for example, are over layered on black paper, building up areas of powerful contrast along with a series of mid tones, like a photogram negative captured by repeated exposure with different objects placed on photosensitive paper. 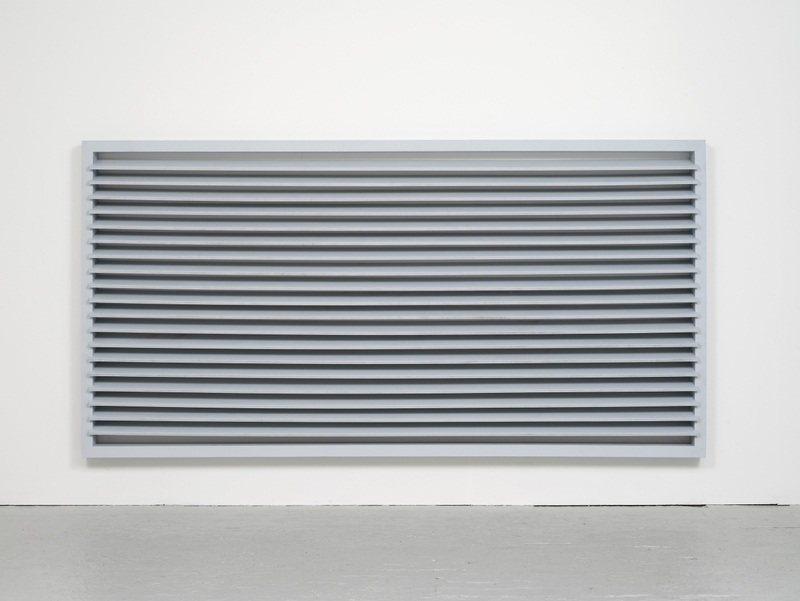 Chu YinHua‘s slides on exhibition at The Mews Project Space provide an interesting critique of the built environment and the way the artist feels nomadic, without a home base, which is perhaps in essence critical of a negative impact upon artists caused by immigration laws. Presented on a small-scale in a row of slide viewers, it is difficult to gage reality. We see out of windows from a series of rooms with a very retro style of wallpaper, 1950s perhaps. 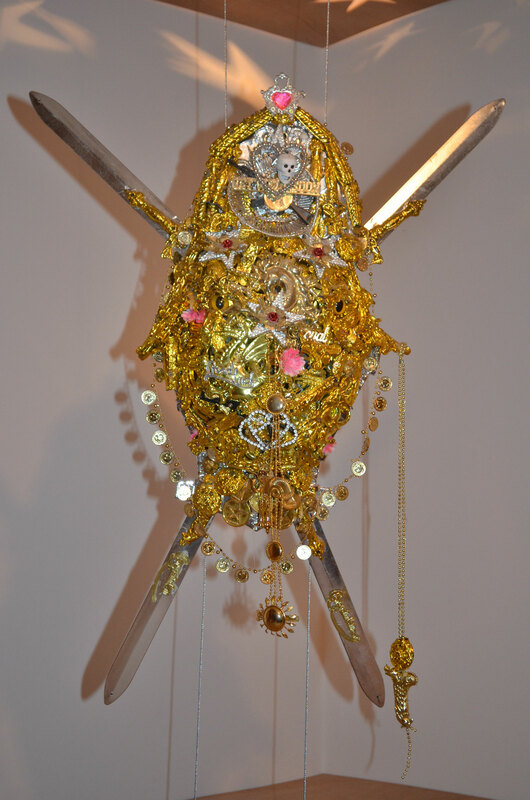 It is only by creating a miniature room which she can carry around with her, that Chu is able to feel at home anywhere. In essence this is alike the boxes Georgian servants had as their only private space (mentioned by Amanda Vickers in BBC series At Home with the Georgians). Whilst the rooms in Chu’s work are miniature, the views are real and include Nelson’s Column in Trafalgar Square and locations around South London in which Chu feels she would be happy to live. They too are mediated however, through being images on a laptop screen behind the model, some at least extracted from Google Street View. Such mediation allows us to now digitally travel to anywhere of our choosing simply at the click of a mouse. Hence Chu chooses to make her home a virtual place. She could have a party on social networking and chat room websites and even offer someone a slice of cake and a cup of tea. The freedoms of consuming digital travel, however, might be said to lead us to exist in a box and never leave it. Well, we can work from home, order in groceries and takeaway, or even go for a stroll around one of the world’s major art museums with the latest Google project. Nearby at the Whitechapel Gallery a retrospective of John Stezaker‘s work demonstrates a similar yet different kind of photographic construction. 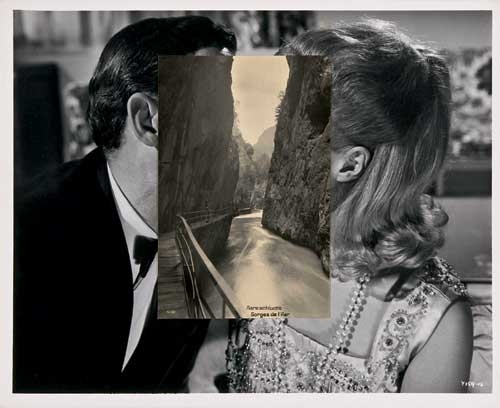 Where Chu constructs the subject scene of her images, Stezaker constructs his images by physically collaging prints of found images, film stills and landscape postcards to create humourous and provocative works.